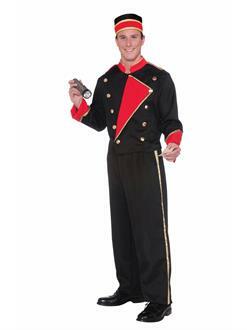 Step into the golden age of cinema and theaters with this Men's Hollywood Movie Usher Costume. This vintage outfit was worn by those with a love for movies and have a passion for fashion . For those who love to dress up and feel the authenticity of the past, this costume is for you! Become the handsome Usher from the age of fame and fortune today and order this timeless costume now! Includes (1) Hat (1) ,Jacket and (1) Pair of Pants.